At the top of Friday's NBC Today, co-host Matt Lauer declared that it "could be a tough day for potential presidential candidate Sarah Palin. We're live in Alaska, where thousands of her e-mails as governor there will be released today." Later, fellow co-host Ann Curry introduced a report on the upcoming release by proclaiming that Palin was "about to face a new political minefield." Without having seen a single email, national investigative correspondent Michael Isikoff argued that Palin "may now be facing a storm." The headline on screen throughout the segment read: "Problems for Palin? Thousands of E-mails to be Released." Isikoff noted how "Palin used her personal Yahoo e-mail account rather than government accounts to conduct state business, to try to keep her communications private." A sound bite was included from former Palin aide Frank Bailey, who bashed her in a recent book. He ominously claimed: "There seemed to be almost a paranoia about keeping her communication private. She, at times, would have me go in to her state account and delete and purge out e-mails that she didn't want to, essentially, ever be discovered." What might be in the e-mails? Controversies like troopergate, Palin's alleged effort to get rid of an Alaska state trooper who was in a messy divorce with Palin's sister. And a response to questions about her daughter Bristol's pregnancy during the '08 campaign....And Bristol's boyfriend, Levi Johnston. Then there's the famous tanning bed she had installed in the governor's mansion and the nearly $17,000 in per diem expenses she billed to state taxpayers when she spent nights in her home in Wasilla. Wrapping up his report, Isikoff got in one final dig at the former Alaska governor: "News organizations first requested these documents nearly three years ago in the summer of 2008....Longer, in fact, than the time Palin was actually governor." MATT LAUER: Plus, what could be a tough day for potential presidential candidate Sarah Palin. We're live in Alaska, where thousands of her e-mails as governor there will be released today. ANN CURRY: Sarah Palin says that she's still thinking about making a run for president, but she's about to face a new political minefield today. Thousands of e-mails from her time as governor of Alaska are due to be released within hours. 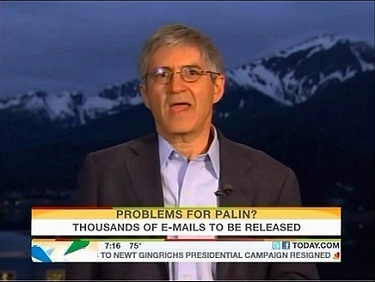 NBC national investigative correspondent Michael Isikoff is in Juneau, Alaska this morning with more on this. Hey Michael, good morning. MICHAEL ISIKOFF: Good morning, Ann. Today, Alaska officials have finally agreed to turn them over, more than 24,000 of Sarah Palin's e-mails are due to be released here this morning. It's a massive document dump that could offer new clues into what kind of governor Sarah Palin was, and if she runs, what kind of president she could yet become. Fresh off her bus tour that attracted a crush of media attention, Sarah Palin may now be facing a storm of a different kind. The release of thousands of e-mails from Palin to more than 50 top aides and officials in Alaska. ISIKOFF: The e-mails cover the first two years of her tenure as governor and continue through September 2008, including the first frantic weeks after John McCain plucked her from obscurity as his running mate. When she was governor, Palin was a frenetic BlackBerry user, firing off e-mails daily to top aides about state policies and venting about her critics. But Palin used her personal Yahoo e-mail account rather than government accounts to conduct state business, to try to keep her communications private. According to Frank Bailey, a former close political aide who recently wrote a book sharply critical of her. FRANK BAILEY: There seemed to be almost a paranoia about keeping her communication private. She, at times, would have me go in to her state account and delete and purge out e-mails that she didn't want to, essentially, ever be discovered. ISIKOFF: What might be in the e-mails? Controversies like troopergate, Palin's alleged effort to get rid of an Alaska state trooper who was in a messy divorce with Palin's sister. And a response to questions about her daughter Bristol's pregnancy during the '08 campaign. SARAH PALIN: Then we have our daughter, Bristol, she's on the bus with the newborn. ISKOFF: And Bristol's boyfriend, Levi Johnston. Then there's the famous tanning bed she had installed in the governor's mansion and the nearly $17,000 in per diem expenses she billed to state taxpayers when she spent nights in her home in Wasilla. Palin says the e-mails won't be a distraction. CHRIS WALLACE [HOST, FOX NEWS SUNDAY]: Are you worried that some of those e-mails could be damaging? PALIN: No. Because, you know, I think every rock in the Palin household that could ever be kicked over and uncovered anything is - has already been kicked over. ISIKOFF: News organizations first requested these documents nearly three years ago in the summer of 2008. But state officials say that the sheer volume of Palin's e-mails was so great it's taken them this long to process the request. Longer, in fact, than the time Palin was actually governor. CURRY: Alright, well thank you so much. Michael Isikoff this morning. - Kyle Drennen is a news analyst at the Media Research Center. Click here to follow Kyle Drennen on Twitter.